Matthew 7:12 (NIV) - So in everything, do to others what you would have them do to you, for this sums up the Law and the Prophets. Taking Care of Me: Where are my ears? - Jesus loves little children! And He loves when children talk to Him in prayer. It is never to early too begin praying with and allowing your child to pray. 1. Begin by teaching your child to fold his hands and bow his head at meal time and bedtime while you pray. To begin, place your hands over the child's to hold them together. 2. Teach the child to say "amen" at the end of prayers. 5. Allow the child to pray whatever is on his/her heart. 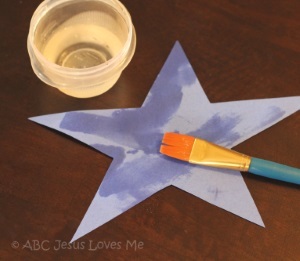 - ABC Book: Using the Child worksheet, cut out the boy or girl and glue to a yellow piece of construction paper. Add yellow star stickers on the child and the titles "C-Child" and "Jesus Loves the Children." Color Train - Add the yellow train to your Color Train by having the child color, with a jumbo crayon, the yellow train. 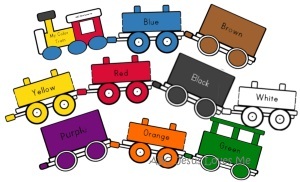 Display the train at the child's level to point and discuss the colors. Using yellow construction paper, cut out a large diamond Using minimal water, have the child water paint the diamond. Talk about the shape as the child paints. - Using the Elephant worksheet, point to the elephant's ears. - Point and count the elephant's legs. - Find pictures of elephants in the books that you read. "More" is especially helpful at meal time and snack time. Before you give the child another bite, help him sign "more." With repetition and consistency, the child will begin to use this sign to let you know when he would like more and eliminate the desire to scream for more. I encourage you to train the child when he is just a little bit hungry and not tired. Sometimes understanding the description to sign a word can be difficult. Remember that the ABCJLM Sign Language Video contains all of the signs. - Point to the elephants as you read the book. - Turning pages is a great fine motor skill. Since board book pages are thick, their pages are easy for little hands to turn. 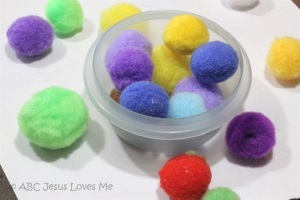 Pom-Pom Transfer - Create a small pile of pom poms on the table or floor along side a shallow container. Demonstrate to the child how to pick up the pom poms and place them in the container.